The Solar Investment Tax Credit was created in 2006 to lower homeowners’ and businesses’ costs to install electricity-generating solar panels. WASHINGTON, DC – U.S. Rep. Charlie Crist, D-St. Petersburg, announced introduction of the Sunshine Forever Act, legislation that would add another ten years of life to the Solar Investment Tax Credit. The bill would allow for an additional decade of increased solar power generation and innovation across the country, he said. The legislation was announced at the St. Pete Earth Day celebration held Saturday (April 13) at Williams Park in St. Petersburg. 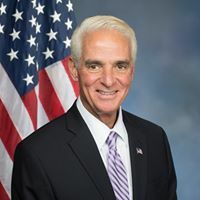 Crist spoke on the positive actions he and his colleagues in the U.S. House of Representatives have taken to safeguard our environment and fight back against climate change, as well as renewable energy initiatives taken by Pinellas County and the city of St. Petersburg. The Solar Investment Tax Credit was established in 2006 to lower homeowners’ and businesses’ costs to install electricity-generating solar panels. Acting as a 30-percent-off coupon paid for by the federal government, the tax credit has experienced great success – with a 1,600 percent growth in solar installations and 374,000 jobs created as of 2017. Currently, solar capacity generates 64 Gigawatts of electricity, which is enough to power 12.3 million homes every year. This offsets 3 million metric tons of carbon dioxide from the atmosphere every year, equal to planting 1.2 billion trees. The Sunshine Forever Act, would extend the Solar Invest Tax Credit for 10 more years, keeping the tax credit at 30 percent through 2029.